The 28th Ordinary Session of the African Union (AU) Heads of State and Government began on 22nd January at the AU Headquarters in Addis Ababa with a three-day meeting of the Permanent Representatives Committee. The 30th Ordinary Session of the Executive Council of the African Union’s Foreign Ministers opened on 25th January and the 9th Gender Pre-Summit and other meetings were held on the margins of the main summit. The theme of the Summit was: Harnessing the Demographic Dividend through Investment in Youth. The AU Executive Council emphasized the importance of upholding human rights, especially women’s rights, in Africa for an integrated, prosperous, and peaceful Africa under the Agenda 2063 framework. Ethiopia praised the theme of the Summit as a timely topic to achieve sustainable development. The country’s foreign minister said “We in Ethiopia understand the critical importance of engaging the youth in the socio-economic as well as the political sectors.” Ethiopia is already working on structural transformation, aiming to ensure inclusive growth by creating jobs for youths. In the three-day meeting, all agreed that the Continental 50-year Agenda, Agenda 2063, could only be successful if it effectively unlocked “the potential, the creativity and the talents of our young women and men”. Delegates unanimously agreed that Africa’s future lay in its youth, and they must therefore be given greater voice in decision-making and in realising the continent’s renaissance. The Summit also covered the issues of economic, peace and security, and African integration, the funding of the African Union and the elections for Chairmanship of the AU Commission. The summit stressed that Africa must revive and strengthen the values and spirit of Pan Africanism, including putting Africa first; commitment to the African people, their dignity and aspirations; and Africa’s passion for democracy, peace, integration, development and building unity of purpose, even in the face of difficult challenges and within “a single institution to which we all belong”. The AU must remain dedicated to its integration and development agenda to unlock the potential, the energy, creativity and talents of Africa’s youth. It must strengthen democracies, governance and human rights, and operationalise Africa’s Governance Architecture. The key challenges and opportunities for Africa’s development, good governance, peace and security, were also discussed in depth. The summit elected H.E. Alpha Conde, President of Guinea, as the new Chairperson of the African Union, H.E. President Idriss Deby of Chad handed over the Chairmanship to President Alpha Conde on 30th January. The Hon. 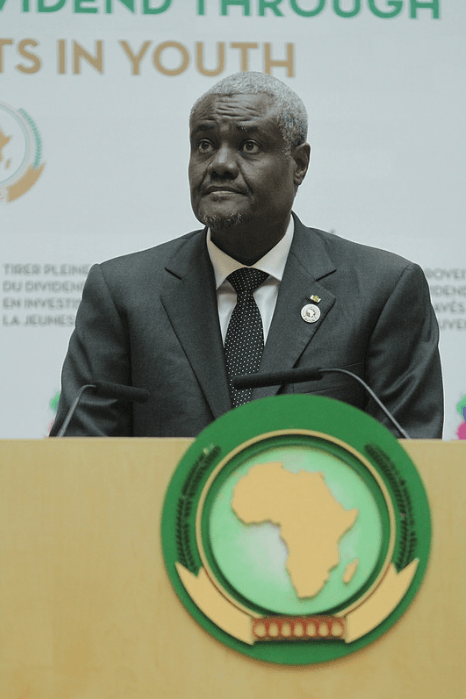 Moussa Faki Mahamat, the Chadian foreign minister, was elected as incoming Chairperson of the African Union Commission, the fourth chairperson from francophone Africa out of five heads since 2002. The AUC Chairperson can discharge the AU vision, which is to build an Africa that is driven by its citizens, and he stressed its relevance to this year’s theme: “Harnessing the Demographic Dividend through Investment in Youth.” The leaders recalled aspiration 6 of Agenda 2063, which clearly states the African Union position of achieving “an Africa whose development is people driven, relying on the potential of the African people, especially its women and youth, and caring for children”. The summit also elected eight Commissioners to a variety of posts. Morocco has re-joined the African Union more than 30 years after it withdrew from the Organisation of African Unity (OAU). King Mohammed VI of Morocco vowed to work in partnership with the rest of African Union member countries to ensure that African resources are utilized by African people. On 31st January, African Heads of State endorsed the Addis Declaration on Immunisation to ensure that everyone in Africa – regardless of who they are or where they live – receives the full benefits of immunisation. The Declaration calls for countries to increase political and financial investments in their immunisation programmes and includes 10 commitments, including increasing vaccine-related funding, strengthening supply chains and delivery systems, and making universal access to vaccines a cornerstone of health and development efforts. The full declaration can be found on the AU website. Antonio Guterres, the UN Secretary-General, commended African countries for opening their borders to refugees fleeing conflict and persecution. According to the UN Refugee Agency, Sub-Saharan Africa hosts more than 18 million refugees, about 26% of the world’s refugees, who have fled conflicts in Somalia, Central African Republic, Nigeria, South Sudan and Burundi.